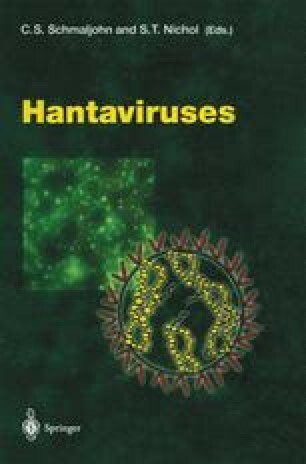 Hantaviruses cause two frequently fatal human diseases, hemorrhagic fever with renal syndrome (HFRS) and hantavirus pulmonary syndrome (HPS) (Nolte et al. 1995; Zaki et al. 1995; Gonzalez-Scarano et al. 1996; Schmaljohn 1996). HFRS-associated hantaviruses cause vascular hemorrhage and kidney dysfunction while HPS-associated hantaviruses cause acute pulmonary edema (Lee et al. 1999; Zaki et al. 1999). Both diseases are associated with acute thrombocytopenia and changes in vascular permeability, and either disease may have pulmonary or renal components (Nolte et al. 1995; Zaki et al. 1995; Gonzalez-Scarano and Nathanson 1996; Schmaljohn 1996; Lee et al. 1999; Zaki and Nolte 1999).